Onion Set Spanish Globe | Henry Field's Seed & Nursery Co.
Sweet flavored and stores well! 85 days from sets. 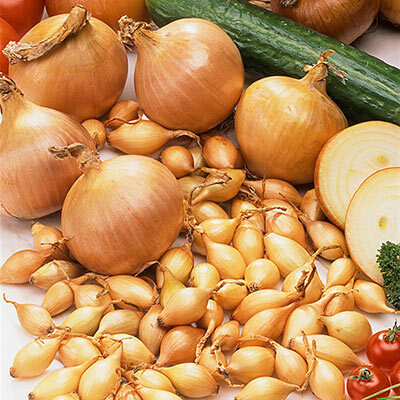 A large yellowish onion with a crisp, firm flesh that'll store well for several months. Its mild, sweet flavor is popular for cooking and eating fresh. Full sun. Zones 3-9. 1 pint. Zone 3 - 10. Annual. For each offer ordered, get 80 ct. set. Flower Form: Clusters of star-shaped blooms. Soil Requirements: Well-drained, sandy fertile soil.